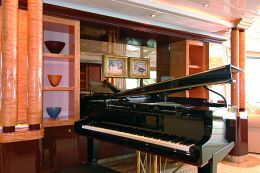 This time, in the section on interior design, we're going to talk about the possibilities of using works of art in glass to decorate the interiors of big yachts. 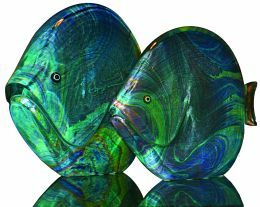 Glass, and especially works of art in glass, haven't been greatly considered to date in designing the interiors of yachts and luxury vessels. This is hard to explain given the special empathy between glass and the sea. Glass comes from the sea. Legend has it that the first glass was created unintentionally by Phoenician sailors who landed to sleep - in those days one rarely sailed by night - on the beach at the mouth of the river Sidon: with the fortuitous combination of fires lit for the night and highly siliceous sand, in the morning the sailors found, among the ashes, small beads and strange forms in a splendid material theretofore unknown: glass. Not many people know that silicon is one of the most common components of the universe, nor that to make excellent glass all we need is the encounter with fire and the silicon in the sand or in pebbles (those from Ticino are famous). It may be purified with the salty ashes of plants that grow on the seashore, and for centuries it was rendered even more malleable by the addition of rust scraped from ancient anchors that had remained on the seabed for decades. 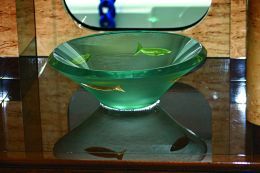 Glass is the material that has most in common with water, it is itself water, "real petrified water". 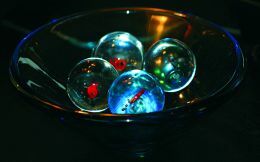 As we shall see below, glass sculptures capture the light, let it pass through splendid transparency, filter and radiate it. 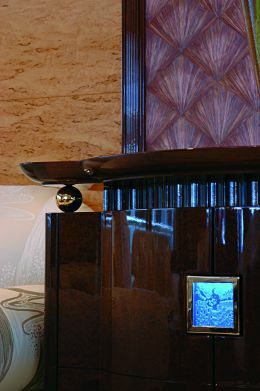 A work of art in glass, set next to a porthole or window, dialogues with the marine horizon, acts as intermediary between the deep blue of the sea and the light-blue of the sky, elicits dialogue between interior and exterior and gives the observer an ever renewed sensation of marvel and peace. 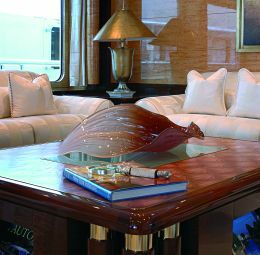 As lovers of glass we are pleased to present a yacht with splendid wooden interiors in which glass has been masterfully used by an expert, both as integral part of the furnishings (details, structural inserts, supercolumniations) and for decorative or decidedly artistic objects (vases, appliqués, leaves, shells). The combination of wood and glass on this boat is a refined and unusual mixture that shows us how even very different materials can provide environments as welcoming as those in a house. We therefore show these works in glass with the certainty that they will be of general interest from a technical and artistic viewpoint, and we hope we shall soon discover other creations using these two materials. 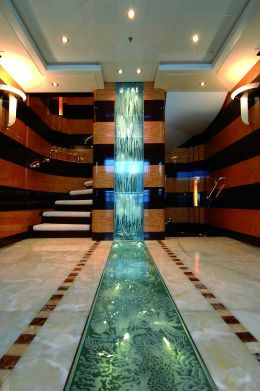 At the side entrance to the yacht we find an application of glass that unites artistic beauty with technical mastery: a load bearing pilaster strip in glass, set in the marble floor, "runs" beneath one's feet then rises vertically on the wall opposite the entrance. The glass is finely decorated and is lit from behind (photos 1030 and 1035-3197). The effect is that of an icy waterfall rich in crystals and snowflakes, as may be seen from the enlarged details. 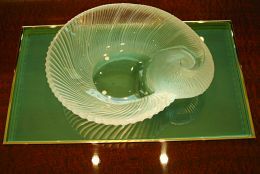 On a low table, a white glass shell on a reflecting plate; and nearby another shelf with light-blue glass. 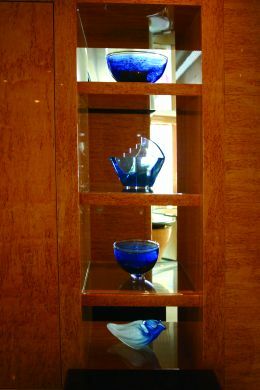 Other shelves of different coloured glass are spread throughout the daytime zone. (3224). 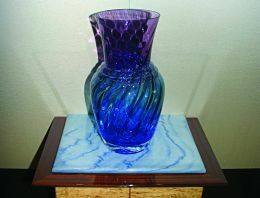 There are other glass items in the corridor where a light-blue tending to violet vase stands on a wooden base with a light-blue flecked white marble top. (photo 3267). In the cabin bedroom - where the colours of wood and the immaculate white of surfaces and materials prevail - there are two large fan- shaped appliqués in white milk-glass and a table lamp with the same characteristics. 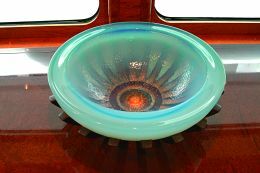 These examples give an idea of the infinite applications of glass in interiors, especially aboard yachts, without excluding the bathrooms where coloured Murano glass washbasins are often the main decorative item. After this visit we had an urge to go to one of the most famous galleries of ancient and modern art works in glass, where the finest episodes in the history of glass have always been the subject of special exhibitions. We asked to be shown a truly original piece that might be suitable for a yacht. The response was "Trittico Grigio" (Grey Triptych), a piece we feel would go well in a niche dividing two spaces, for example the living and dining areas. 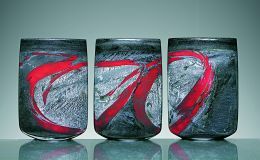 This work in glass could, on its own, characterise an entire environment.